Download Brightline’s logo in different versions and our brand guidelines. 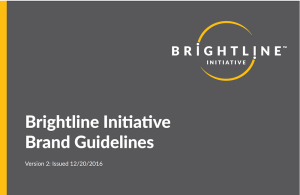 To ensure consistency when using the Brightline Initiative logo, please follow the brand guidelines contained in this document. The Brightline Initiative logo calls attention with its boldness. Tapered circular strokes connect the two I’s in the Brightline word mark. The primary logo should be used whenever possible. One-color version of the Brightline Initiative primary logo available for circumstances when it is not possible to use the primary color version. The alternate logotype may be used when the less attention is appropriate or when less space is available. One-color version of the Brightline Initiative alternate logotype available for circumstances when it is not possible to use the primary color version.